"Stella" was sired by the UK import NZ Ch.Crookrise Sirius Imp UK out of our CH.Porthcurno Touch Of Gold. Sirius came to N.Z. as a young dog from the UK but had been used by Cecily Robertshaw several times at stud before leaving the UK, and he proved to be an influential dog both sides of the world. 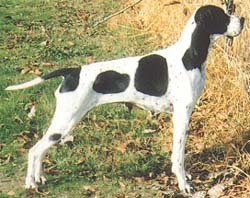 Imported into New Zealand by John & Carol Craig & Helen McReady, he was not used widely at stud, but he did sire two out of the only four Grand CH.Pointers so far in the breed. Stella is owned by our friend Marlene Zanders (Pinedene) and has been both a great show dog and dam for her. Mated to our first import NZ Ch.Galema Kiowa of Crookrise Imp UK she gave Marlene her Ch.Pinedene Luv Is Blue. Mated to UK Ch.Crookrise Old Glory (Imp UK) she has kept Pinedene Aimin'For Glory.